This recently updated condo offers spectacular finishes with stainless steel appliances, flat screen TV, wood burning fireplace and much more. 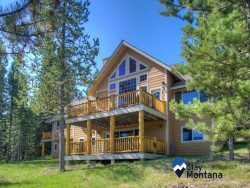 Our condo is four miles away from the biggest (and best) downhill skiing in the west and a few minutes from Big Sky town center. The living area is an open space concept with a fully equipped kitchen to make a gourmet meal, dining area seating with 4 bar height stools that can be used at the high-top table or at the bar countertop and a cozy living room featuring the wood burning fireplace. There are two bedrooms featuring queen size beds. There is shared coin-operated washer and dryer in complex and a recreation center with pool and hot tub nearby. - Electric Range/Oven, Coffee Maker, Electric Tea Kettle, Toaster, Blender, Roasting Pan, Bakeware, Basic Spices, Trash Bags, Dish Soap, Dishwasher Soap, Sponge, and Paper Towels. - 4 bar height stools that can be used at the high-top table or at the bar counter top.